Reigning American League Most Valuable Player Mookie Betts said Wednesday he doesn't expect to sign a contract extension with the Boston Red Sox. He told Jason Mastrodonato of the Boston Herald he's firm that he will enter the 2019 season playing under his existing one-year, $20 million deal. "That's exactly what I expect," the outfielder said. "Didn't expect anything to happen until I'm a free agent." Betts confirmed to reporters he rejected an offer of eight years and $200 million following the 2017 season, first reported by Joel Sherman of the New York Post. Betts can become a free agent after the 2020 season. With baseball's brightest young stars now committed to monster deals -- Manny Machado (San Diego, 10 years/$300 million), Bryce Harper (Philadelphia, 13 years/$330 million) and Mike Trout (Los Angeles Angels, 12 years/reportedly $430 million) -- Betts will command much more than $200 million if he remains on his career trajectory. "I love it here in Boston. It's a great spot. I've definitely grown to love going up north in the cold," Betts, a 26-year-old Tennessee native, told reporters. "... That doesn't mean I want to sell myself short of my value." 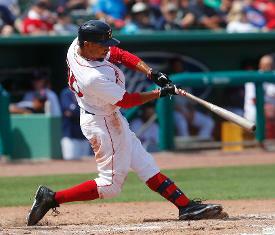 In 2018, Betts led the AL with a .346 batting average, a .640 slugging percentage and 129 runs. His .438 on-base percentage ranked second to Trout's .460 mark. He displayed power and speed, hitting 32 home runs and stealing 30 bases. In 644 career games over four-plus seasons with the Red Sox, Betts has a .303 career batting average, 110 home runs, 110 stolen bases and 390 RBIs.